There’s no doubt that stir-frying is the most colourful and well-known Chinese cooking technique, however, many Chinese dishes call for the food to be deep-fried. Deep frying is a cooking method that bathes or submerges the food in hot liquid fat. You will see many different kinds of “deep-fried recipes” in not just Chinese cuisine but all kinds of cuisines. As with all aspects of cooking, the Chinese people are quite creative in their use of deep-frying. In the West, people tend to tend of deep fried foods as having been coated with batter prior to cooking. The Chinese employ these methods to prepare certain dishes such as ginger beef, sweet and sour pork or chicken (deep-fry the pork or chicken before stir-frying with the sweet and sour sauce), tea smoked duck, sesame balls and more. On the other hand, some recipes call for an item to be deep-fried in the initial stages of cooking. An example of this would be to deep-fry a fish at first and then steam or mix with sauce then serve. Deep-frying has gotten a bad reputation in recent years. People in general believe or associate deep-fried cooking with clogged arteries, obesity, cancer and stoves and kitchens decorated with unwanted oil splatters. Here is a step-by-step process designed to make deep-frying easier and to help reduce the fat content. Do I need to use a wok for deep-frying? No. Some people feel safer sticking with a deep-fat fryer. If you do use a wok make sure it is securely in place. Flat bottomed woks work best for electric ranges and round bottomed woks suit gas stoves (make sure the round bottomed wok is securely in place on the wok stand). 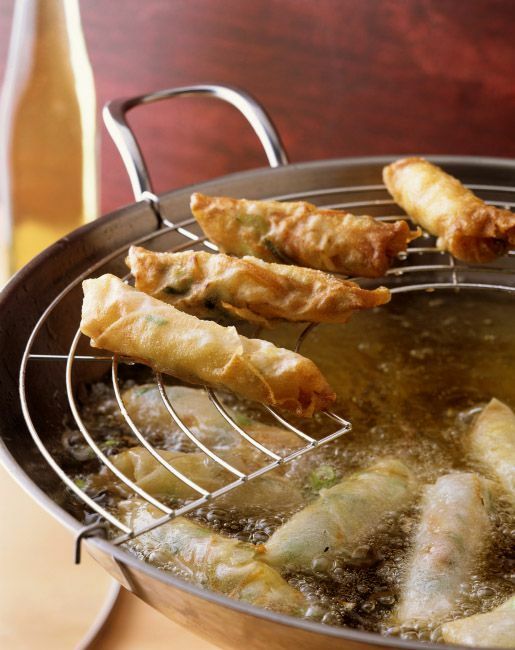 If you don’t have either a deep-fat fryer or wok, you can use a deep sauce pan for deep-frying. How do I put the food into the wok? Be careful to slide foods in to prevent splattering. Also, add ingredients in small amounts and don't overcrowd the wok. Overcrowding will lower the temperature and may lead to splattering or spillage. What is a good temperature for deep-frying? It depends on the recipe, but most suggest you heat the oil to somewhere between 350 degrees and 375 degrees Fahrenheit. (This partly depends on the size of the food being cooked, as larger items can be deep-fried at a lower temperature). Remember, though, the temperature will drop slightly when you put in the food. Sometimes if I need to deep-fry foods like prawn balls, chicken legs, pork chops etc, I will turn the stove off immediately after I have put the food in the oil for deep-frying. I will then wait 1 to 2 minutes then turn the stove back on and keep frying until the food is cooked. This method can make sure food is completely cooked inside and out but will also have a nice colour and a crispy texture. What type of oil should I use for deep-frying? Peanut oil is good, as are other vegetable oils. Chinese recipes used to call for lard, but most don't anymore because of the fat content. One of the advantages of peanut oil is that it does not burn easily even at high temperatures. Sesame oil, on the other hand, is not used for frying as it has a low smoking point. How much oil should I add? Most recipes will call for a specific amount of oil, although some just list "oil for deep-frying," under the ingredients, while others give a range such as 2 to 4 cups. How much oil to add depends on the item being deep-fried. Basically, you need enough to make sure that the ingredients are completely submerged under the oil. To be safe, however, it’s important to leave several inches clear at the top of the wok as the oil level will rise when the food is dropped in. How can I tell when the oil is hot enough? The easiest way is to use a deep-fry thermometer. In The Modern Art of Chinese Cooking, Barbara Tropp recommends a dial-type deep-fry thermometer with a kettle clamp that can be clamped to the side of the wok. The advantage of this type of thermometer is that you don't need to hold it at all. Of course, you can always go the traditional route and use a wooden chopstick or a piece of bread to check the oil. If the oil is hot enough, it will form bubbles around the object but add to the fact that you need to adjust for a drop in temperature when placing the food in the wok, a novice cook is better off relying on a thermometer. If you don’t have a deep-fry thermometer a candy thermometer will also work. How can I reduce splattering? The food you are going to deep-fry should be at room temperature. This reduces the drop in the temperature of the oil when you put it in, lessening the chance of splattering. You might want to dry the food with a paper towel. If the food to be deep-fried is in a sauce, use a slotted spoon to let it drain before adding it to the wok. Similarly, if the food is batter-coated, make sure all the excess batter has dripped off before placing it in the hot oil. What if the recipe calls for the food to be deep-fried twice? This is a method commonly used in restaurants with dishes such as ginger beef - they will cook a batch and then re-cook a portion when a customer orders the dish. This gives the food a crisper coating. Make sure to retest the temperature of the oil before you deep-fry a second time. Yes, you can reuse cooked oil up to five times (five may be stretching it a bit). Just let the oil cool, strain it and store in the refrigerator. When the oil is no longer usable the color will darken and it may start to smell rancid. Oil smoking at normal temperatures is another sign that it has gone bad. How can I reduce the amount of fat? First, by keeping the temperature up. Food cooked at too low a temperature will be greasy. Secondly, by not overcrowding the wok, which again lowers the temperature, leading to greasy food. Finally, using a wok actually helps - the unique shape of the wok means that you use less oil to cook with than is the case with a deep-fat fryer. A large Chinese wire mesh spoon (also called a "skimmer") is invaluable for moving the food to and from the wok, and maneuvering it while deep-frying.